Last year, in the last semifinal game of the Ivy League tournaments, the Harvard and Princeton women’s basketball teams played before a crowd significantly smaller than that for their male counterparts’ games earlier in the day. This contributed to the women’s coaches’ concern that the schedule of the tournament was inequitable. 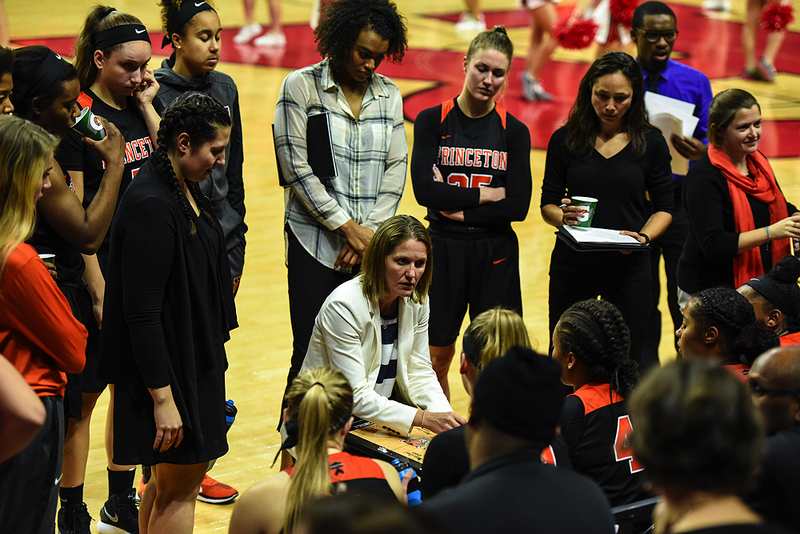 Princeton head coach Courtney Banghart leads her top-seeded Tigers into this weekend's Ivy League tournament. She argues that more needs to be done to clarify the purpose of the conference tournament in order to identify the format that follows. Roughly five hours later, as the Harvard and Princeton women’s basketball teams finished the second women’s semifinal, the atmosphere was different. The crowd had dissipated. (A single ticket admitted fans to all four games, and the Ivy League reported the same attendance for each, but video of that women’s match showed many empty seats, especially in the upper sections.) There were a few coordinated chants, but mostly the isolated cries of individual fans stood out. The game was shown live only on ESPN3, an online portal, and replayed later on ESPNU. Yet one year later, the coaches’ discontent has lingered, if not intensified. And it reflects difficult negotiations about this year’s game times, decades of frustration, and broader questions about how the tournament is balancing social, athletic, and commercial objectives. In the context of the league’s aspiration to make its sports programs not only genuinely beneficial for student-athletes, but also representative of the schools’ larger social values, this is a serious conflict. Last year, the Ivy League celebrated—and heavily marketed—“the inaugural Ivy League men’s and women’s basketball tournaments.” Technically, this was true: the conference had never had a combined men’s and women’s tournament to determine who would receive the league’s automatic NCAA tournament berth. But the billing obscured the fact that there had been nine previous Ivy League basketball tournaments, all among women’s squads. Eight were played from 1975 to 1982, when the teams participated in the Association for Intercollegiate Athletics for Women; another occurred in 1986, after Ivy League basketball joined the NCAA. That sentiment has shifted during the last decade, in part because of a change in the competitive landscape on the men’s side. From 1959 to 2007, Penn and Princeton won 50 conference championships. The rest of the league was often weak. A tournament risked a weaker team representing the Ivies in the NCAAs, and some felt that Penn and Princeton were trying to protect their existing advantage. From 2008 to 2010, Cornell captured three conference titles, Harvard won five championships from 2011 through 2015, and Yale claimed a pair of crowns as well. After the Penn-Princeton stranglehold loosened, the men were open to a tournament. Even after the tournament announcement was made, though, numerous questions remained, including the game schedule. Ultimately, the preferences of broadcast partner ESPN prevailed. (Last year, the league reached its agreement with ESPN late in the network’s scheduling process, which limited flexibility, Harris explained.) The women’s coaches expressed some unease about the schedule; but there was enormous excitement in general about the tournament, as well as about the broader recognition that it was finally happening. The actual experience of the 2017 tournament, though—the late and early game slots, the small crowd—shifted the women’s perspective and heightened their concerns, which the coaches shared with league officials during an April 2017 meeting. According to one attendee, Delaney-Smith suggested that the women’s teams were being treated like “second-class citizens.” The group also discussed the tournament’s location (including Penn’s advantage from hosting), the reasons the event was established, the extent to which revenue was a priority, and whether the Ivy League had studied how other conferences structure their conference tournaments to balance these objectives. One of the biggest questions at the April 2017 meeting was whether the women’s semifinals would be played back-to-back, as opposed to bookending the men’s semifinals. The coaches supported that change, believing it would make it easier for fans to attend both women’s games. The coaches then held a conference call so they could “present a unified stance,” in Banghart’s words. League officials asked to participate, but the coaches declined. As Banghart put it, the coaches would “feel more comfortable” speaking as a group. She then followed up with an email and phone call to Ivy officials in which she and her colleagues shared their disappointments and hopes. The league responded with a more detailed explanation of the factors affecting the game times. These factors, as Harris explained in an interview, include missed class time, the NCAA tournament selection committees’ timetables (the men’s bracket is unveiled on Sunday at 6 p.m. and the women’s bracket on Monday at 7 p.m.), fan and coach preferences, and television slots. 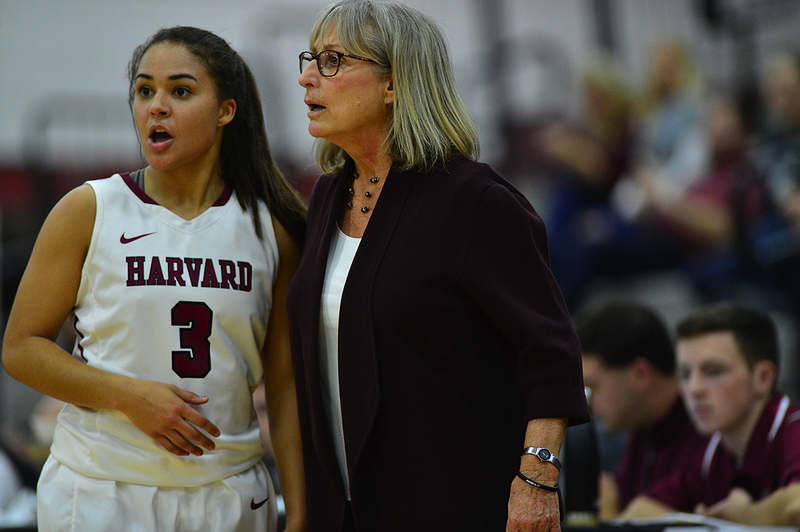 All eight Ivy League women’s basketball coaches spoke to Harvard Magazine for this article. All concurred that the game times presented a challenge, although they differed in their intensity of feeling and their thoughts on the most important priority moving forward. Penn coach Mike McLaughlin focused on making the most of this year’s event. “I still think we can put together a phenomenal tournament with eight great teams out there,” he said. Others put the scheduling question in the context of a larger debate about the tournament. Columbia coach Megan Griffith advocated expanding the field to all 16 men’s and women’s teams (currently, only the top four men’s and women’s teams qualify), though, she noted, this might interfere with playing the tournaments together in one building. Princeton’s Banghart questioned playing the event at the Palestra, Penn’s home court. To her, this institutionalizes a Quaker home-court advantage that exacerbates the risk that the league does not send its best team to the NCAA tournament. She also argues that this points to a bigger question as the league tries to balance different priorities (national exposure, competitive balance, equity, the student-athlete experience, and marketing). If the league is going to risk a championship upset that might send a weaker team to the NCAA tournament, what gains is it seeking in return? From the perspective of those citizens, the student-athletes, the jury is out. Griffith, who played for Columbia and graduated in 2007, said that while it is important for coaches to weigh scheduling, her mentality as a player would be, “Let’s go. We gotta compete.” Another former Ivy women’s basketball player who participated in the NCAA tournament described the turnaround time for the second women’s semifinal winner (roughly one hour shorter than that of their male counterparts) as “crazy,” noting that one plays extra hard in a playoff. Amid this complex discussion, the Ivy League tournament tips off on Saturday in Philadelphia.